News received on Monday May 7th 1945 of the German High Command’s unconditional surrender put the people of Sutton Coldfield “in joyous mood”. The following morning newspapers announced that Tuesday May 8th was Victory in Europe Day, and a national holiday. A thanksgiving service was held in King Edward’s Square in front of the Town Hall, where flags of the United Nations flew from twenty-two masts. 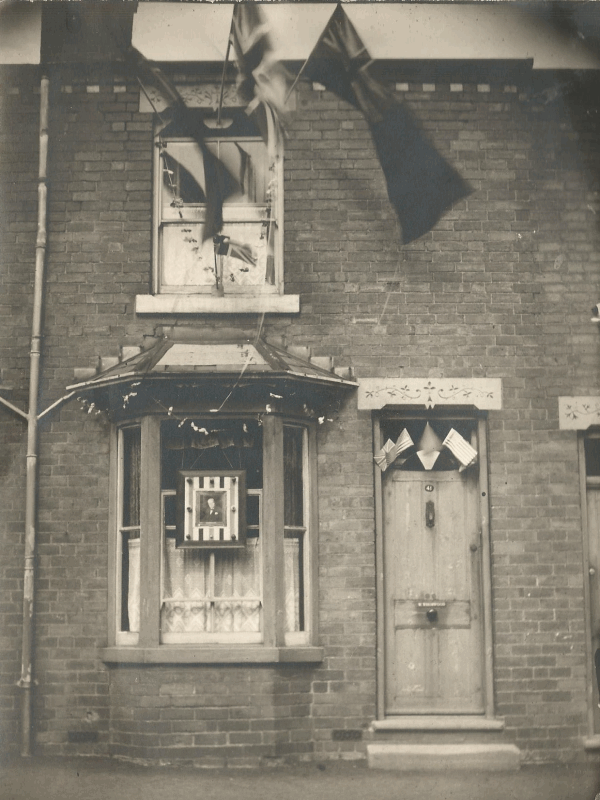 Many houses were decorated with flags, bunting and victory posters. At night the Council House, Town Hall and Fire Station Tower were outlined with hundreds of coloured lamps. All over town bonfires were lit and fireworks let off, and there was dancing in King Edward’s Square until late. Quantities of beer were consumed in the pubs that night. Street parties were organised; a large one in Station Road, Wylde Green near the railway bridge included a stage with music - “the atmosphere and group singing was joyous and noisy with all of us just surfacing from six years of war, blackouts, rationing and bombing” recalled John Wilson, who was 14 at the time. Most Suttonians of my age or older remember the street parties, like the one in Kings Road which Roy Billingham recalls as an affair of trestle tables and blancmange with “lots of pop, and the weather was OK”. Jim Whorwood doesn’t remember much about his street party in Queen Street, but his family went to a big assembly in King Edward’s Square to hear the Mayor of Sutton make an official statement from the balcony of the Town Hall. Men were still serving in the armed forces. An article in the Birmingham Post VE Day Souvenir of May 1985 gave the recollections of Harry Price, then of Vesey Close, Sutton Coldfield, who sent in a photo of a tank of his Regiment advancing through Schleswig Holstein on VE Day. He remembered the Royal Scots Fusiliers’ victory march through Bad Segeberg, fifty kilometres north-east of Hamburg, on VE Day, and a glorious summer spent guarding thousands of German prisoners of war. The Whorwood house at 41 Queen Street, (now demolished), photographed on VE Day, May 8th 1945 ( Photo- Jim Whorwood).